Skiing, having fun and enjoying ultimate piste pleasure! The Spieljoch skiing area is the first skiing area in the Zillertal and offers with the longes snow-covered downhill slope in the Zillertal fantastic ski days for your winter vacation with the whole family! You can find the valley station of the Spieljoch skiing area directly in the village of Fügen , and just below the valley station there are a small exercise slopes for your children, so that they as well can quickly develop into piste professionals and ski aces! While you have fun on the pistes of the family Spieljoch skiing area , and your older kids test their skills in a ski school for children in Fügen or Kaltenbach, our child carers at the guest kindergarten Zwergerl Club affectionately take care of your little ones aged between 3 months and 7 years, on an hourly, half-day or full-day basis. 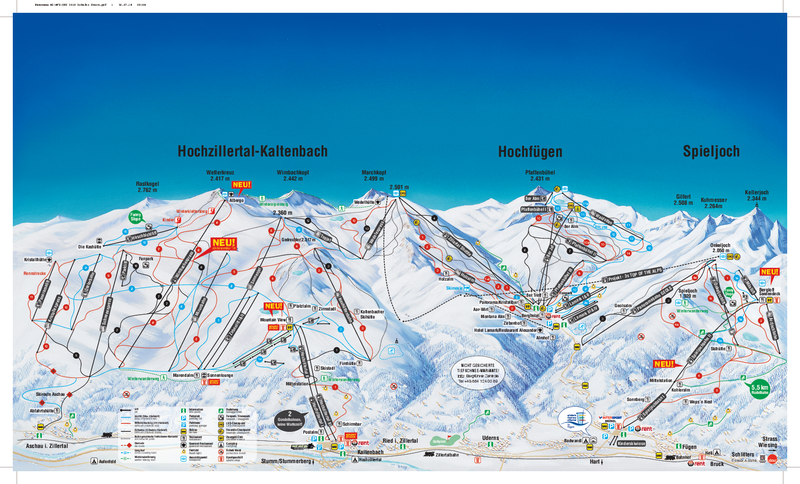 With the free ski bus connections of the first holiday region in the Zillertal you can reach all places and skiing areas, and as such also the Spieljoch skiing area , simply, fast and comfortably. With the shuttle bus between "Panoramabahn Geols" and Skiing area Hochfügen you get in about 10 minutes to some more runs. ✷ small snow professionals who prefer milder slopes and training runs. With the construction of the new Spieljoch cable railway there are n ew exciting adventures for young and old - activities and entertainment for everyone . An exciting time in the ski area Spieljoch is guaranteed! Beginning from the n ew toboggan run to the great winter hiking trail . With the new construction, there is now a new sports shop in the ski resort in the valley as well as in the mountain station. Now it is no longer a problem to stand on the ski and realize that something does not fit. In the sport shop they are happy to help you.